Are concrete floors supposed to cure for a certain time before applying an epoxy? Our garage floor was poured about 6 months ago–has never been driven on as house still not ready yet. You need to wait at least 30 days for new concrete to cure before applying a coating Cheryl, so you are good to go. Just remember though that new concrete still needs to be prepped properly by either acid etching or grinding before applying most coatings. i just recently put epoxy on my concrete floor. it went well except for one small area. i grinded the faulty area off and got back down to the concrete, however i was feeling it and im worried that the concrete is now too smooth for the replacement expoy to properly adhere. do i need to see about roughening up this small area (about 15 square feet), or will i be ok as it is? If you used a standard concrete turbo cup wheel to grind the concrete then you should be fine Michael. Just place a few drops of water on the concrete to double check. If it turns dark immediately and is absorbed into the concrete you are good to go. I used a 4″ grinder with a standard 4″ concrete grinding disk. I didn’t use a cup wheel. Most of your 4″ concrete grinding wheels are cup wheels Michael, though not all state that. Did you do the water drop test? i tried the water test. i tested the areas around the place i grinded, and then the grinded area itself. the areas that were grinder took longer for the water to absorb but it eventually did. i think im good to go. kitchen. Both acid treatment and grinding cant be done as the width of the line would be 4inch. What kind of surface are you wanting to apply it to Kunjabihari? The surface is made up of tiles. The tiles are not shiny or glossy. They are heavy and strong tiles. I want to mark different area of a commercial bulk cooking wet kitchen with different colours. I am looking for a strong and long lasting paint. The width of the lines will be of 4 inch. We can’t tell you for sure without knowing exactly what type of tiles they are. What we can tell you, however, is that any paint or coating applied to them will require that you properly prepare and rough up the surface in order for it to adhere properly. If you don’t it will peel up. Especially in a wet environment. We suggest taping out the lines with a good industrial tape and then sand the tiles between the tape with 60 grit sandpaper. In terms of product, a polyurea or polyaspartic coating would be your best choice for the lines if you want little down time. You can walk on it with a few hours of application. Epoxy will work well also if you can go for 24 to 36 hours before putting it back in use. Can I use diamond hand pads to grind a floor to smooth it for an epoxy coating? Hello James. Diamond hand pads are generally for polishing and would not provide the proper CSP profile for a floor coating. Plus, you would be there for days trying to knock down the concrete surface by hand. Yes, that will work George. Grinding is always the preferred method George, but we realize it’s not always the most feasible for some people. If you decide to etch, we recommend muriatic acid for the best results. We have an article here that discusses the proper way to etch for muriatic acid. The eco friendly etch kits are not as effective. What if the cement is roughly 10+ years old and has been painted with acrylic paint in the past but now want to prepare for epoxy? Mechanical profiling is not an option. Is it still necessary to use acid etching? The floor is not flat and will need to use some kind of compound to fill in the cracks and make more smooth and level. Thank you in advance. If you want to use epoxy Habib, you will need to remove the acrylic paint first. Acrylic paint does not bond nearly as well as epoxy does. The bond of epoxy is only as good as what it is bonded to. Since acrylic paint does not bond as well, the epoxy will peel up with the paint. You can’t use acid on paint either. Acid works by reacting with the free lime in bare concrete. It is not a paint stripper. In order to apply the epoxy effectively and correctly without grinding, you will need to remove the acrylic paint with a paint stripper and then acid etch the bare concrete. I have just finished grinding my screened porch concrete floor in preparation for adding a thin concrete topping. I want to reslope the floor to a floor drain to make washing down easier. Located in Houston area, where freezing weather is not typical, but occassionally happens. The topping will be a sand/topping mix (where thickness will be 1/2″ to 1″) or a concrete resurfacer mix (where less than 1/2″). Will I need to re-grind the finished topping surface AGAIN before an epoxy coating can be applied? Also, there are several cold joint cracks in the original concrete, that vary in width from 1/16″ to 1/8″. Should these cracks be handled before adding the topping, and if so, how do you recommend? Hello DIYer. If you have actual cold joints, the line formed by the joint may look like a crack, but it really isn’t. You don’t have to do anything special when applying an overlay or topping over a cold joint. However, if you have actual cracks in the concrete you will want to repair those with a 2-part epoxy crack repair product and then grind it flush before you applying the topping or overlay. If you have any contraction joints that are being covered you will want to honor them with a saw cut joint or troweled joint over the existing joint. If you don’t, you run a high risk of developing a crack over those joints in your topping. Yes, you will need to grind again for the coating. Troweling effectively closes concrete pores and inhibits penetration of the epoxy. Grinding also removes excess laitance at the surface which can interfere with adhesion as well. I am looking to add porcelain tile to the garage. The existing floor is about 15 years old and has never been painted or sealed. Does it need to be etched or grinded or is a good power wash sufficient for the thin set to properly seal. As long as the concrete has not been sealed or machine troweled to a very smooth finish, power washing will suffice before laying your tile Paul. Hi Shea, i have a problem. The floor that im planning to do is sorrounded with plywood walls, now i can’t use a high pressure hose to clean it because the water will damaged the plywood walls. So my question is how can i clean it? You have a couple of options April. The first is to tape cheap plastic drop cloths to the first 3 or 4 feet of the wall. It will protect the wood from the water. The other option is to just grind the floor. Unless you have bad oil stains, grinding does not require the use of water if you use a dust shield and vacuum attachment. After you are done grinding you can vacuum the concrete with a shop vac and it will be ready to get coated. Thank you for the helpful site. I am installing an epoxy finish on my very, very old garage floor. Many years ago an old car was left in the garage and I can still see oil staining, even after aggressive scrubbing with degreaser and power washing several times. Is grinding the floor the correct next step or can I ignore the stains and coat over them? Hello PK. Regardless, the concrete will need to be acid etched or prepped by grinding before applying your coating. If you apply water drops to the stains right now and water beads up, acid etching will not work on those areas and grinding will be required. The grinding will help open the pores of the concrete and allow you to attack it with a degreaser again for better results. The ultimate test for oil stains after all the prep work is the water drop test. If the concrete immediately turns darker and starts to absorb the water, then you are good to go. Keep mind that the concrete will always look a darker color where the stains where. If water still beads after that, then the epoxy will not adhere. If that turns out to be the case, you will need to apply a special “oil stop” epoxy primer first before applying your epoxy base coat. Oil stop epoxy primer is formulated exclusively for badly oil stained concrete. Hi , I wanted to try using epoxy on my garage floor ,,,I have a 2 part epoxy paint I bought from a local box store on it now its been down for about 10 years most of it seems very solid but I want the best install I can get so I’m thinking about using a grinder to clear all the finish off.i think I can get the prep part done right but not with out some work .I have a question on putting the epoxy finish on when it comes to 2 areas of question …the wall are not an issue cuz the epoxy will just flow up to it but I have a plastic center drain,is that tapped off?? ..how is that handled and also where the concrete goes out side of the garage door …guess you could call it the skirt which is subjected to winter and weather etc…do you end the epoxy under where the garage door rubber seal is ?? if so how do you end it?? tape ? ?,or will the epoxy hold up …2 part epoxy paint that is on there now has worn off a lot . Hello Mike. Yes, you want to tape off the drain. The best way is to lay painters tape across the top and then use a razor blade to trim around the edges. When you apply the epoxy, try not to get too much on the tape. Once the epoxy has cured enough for you to walk on it, pull the tape off the top of the drain while using the razor blade to trim any excess epoxy away. If you wait too long to do this the razor blade will not cut through the epoxy. As for the garage door threshold, it’s best to terminate the coating where the door comes down. You can either tape the area off or use a circular saw with a concrete cutting blade to cut a 1/8″ deep keyway (joint) to terminate the epoxy at. Just tape off the side of the joint that will not get the coating. 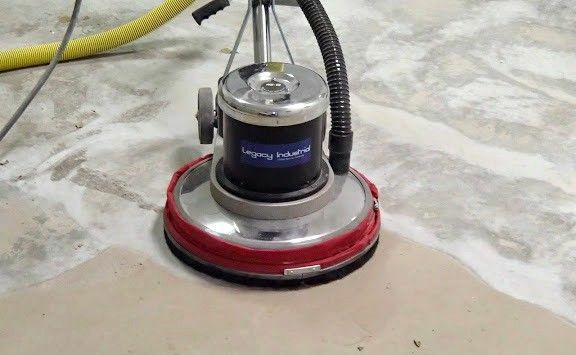 Hi, any special precautions to look for if I use a chemical stripper to get the paint off the floor first followed by using a sander/grinder to clean the concrete surface after stripping….will the use of a stripper cause issues with the epoxy primer ? should I acid wash after using stripper? how long should I wait before putting the primer down after the floor has been stripped ,sanded and acid washed? If you are going to grind the concrete Mike, then you don’t need to use a stripper. Grinding will take the paint right off, prep the concrete at the same time, and no acid etching is necessary. Hi, I just epoxied my garage floor and used the little color chip’s, however I am not very happy with the turn out and would like to add a second coat, will reapplying over the chips be ok??? Yes, it will OK Scott. Just be sure to get the second coat reapplied within the manufacturer’s stated recoat window or you will have to rough up the surface with 100 grit sandpaper before applying the second coat. I am prepping a floor for dye or semitransparent stain and have concerns about old paint, tile adhesive and construction adhesive. Will a floor maintainer be aggressive enough to get through all these and leave the floor ready to stain or do I need to use a scarifier? Your best bet James would be a 10″ Edco unit. These are more aggressive and will take all of that up without issue. Home Depot and most equipment rentals have them available. When applying a 100% solids epoxy Marc, you will definitely need to grind the remainder of the old coating in order to provide the correct surface profile. 100% solids can be applied directly to bare concrete, but it’s highly recommend to use an epoxy primer first. The Rust-Oleum product you are looking at is designed for the typical DIY home improvement kit type of coatings. We haven’t heard any feedback with this product yet and we wouldn’t recommend it as a primer for 100% solids epoxy. Everything that has been tried in the past to circumvent proper surface prep has not worked out in the long run. 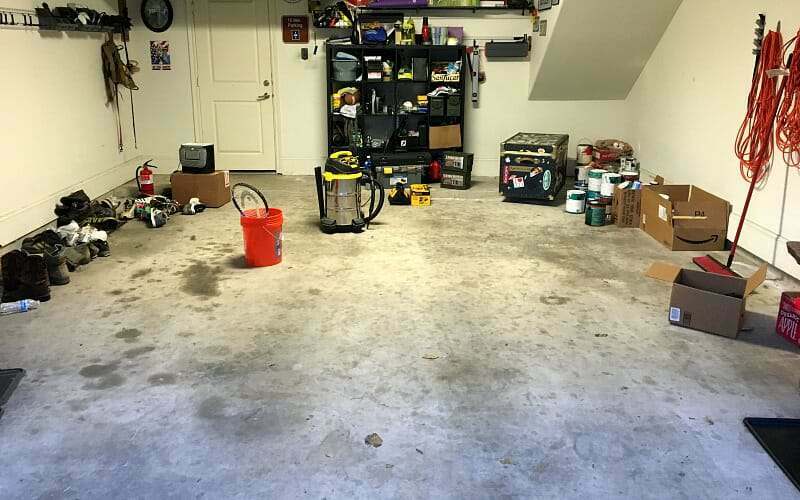 I am looking to add epoxy to my garage floor, which is about 15 years old. There are some cracks/chips in the concrete (no sealer on top) along with some white paint stains along the sides from when the garage wall was painted. I am planning on renting something from Home Depot to do the grinding. What is the machine called that I need to rent? Also, do I need to patch the cracks and chips before or after I grind out the garage? Want to make sure I am doing the steps in correct order so I don’t have to go backwards. Thanks for you help! You will want to do all your repairs first and then grind. We have an article about grinding here. It covers the type of machines you can use from Home Depot. If using the Diamabrush it’s a good idea to have a 4″ grinder and turbo cup wheel to grind all your repairs flush. The Diamabrush is not as effective for that. Thanks Shea. 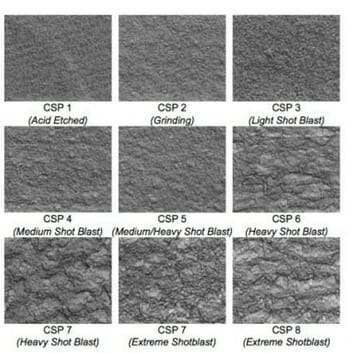 Just to make sure, as I’ve seen a few different process steps while researching- you don’t need to acid etch the garage AND grind it, correct? It is either one or the other depending on budget? Want to make sure if I’m grinding that I dont need to do acid etching first. Planning on cleaning off the surface first with a power washer, fixing the chips/cracks, cleaning off again, then grinding. Does that sounds correct? Thanks for your help – great info you have here. You are correct Btped. Acid etching after grinding doesn’t help with the profile and only introduces moisture into the concrete once more which has to be accounted for. There is no need to clean off the surface again after doing your repairs. The repairs only create the same dust and debris that grinding will produce. Once the repairs are done just go strait to the grinding process. Epoxy resin doesn’t seem to be a very suitable coating for driveways or garage floors! Yikes. As you have found out Mike, epoxy is not appropriate for outdoor use and for many reasons. While it is quite suitable for indoors and garage spaces, if used outdoors it will amber (turn yellow) and not provide a suitable surface in wet conditions. Epoxy is a non breathable sealer that effectively coats the surface of the concrete with a non porous, tightly cross-linked thermosetting resin. This type of surface tends to be very smooth. We recommend grinding the epoxy back to the bare concrete and then apply a penetrating concrete sealer. The freshly ground concrete will provide plenty of natural grip and the penetrating sealer will not affect the anti-slip properties of the concrete surface. You have a great site here with helpful info. I went around my garage and repaired the small pencil sized holes and little chips with PC Products 72561 PC-Concrete Two-Part Epoxy Adhesive Paste (you recommended on a different page here). I did all the ones that were noticeable, but my question is do I need to do all the hairline cracks as well? They are barely wide enough to fit a pencil tip in, so I wasn’t sure if I would just be wasting time doing those. Also, once they are cured, do I need to grind them flush first or can I go straight to the grinding portion (renting from Home Depot). The type of coating can determine what you can get away with in terms of cracks Bpeder. Most hairline cracks will be fine if you are using a higher solids coating. For the patch repair, a small grinder with a concrete turbo cup wheel will make fast work of smoothing them out flush. The Diamabrush from Home Depot does not do as well a job. You can always grind the concrete first with the Diamabrush and then go back over the repairs with a grinding wheel if it doesn’t take them down flush the way they should be. what kind of epoxy do you reccommend? I havent seen anything on here which you highly talk about. I was planning on getting Rust-Oleum EpoxyShield 2 gal. Dark Gray Semi-Gloss Professional Floor Coating Kit from my local orange store. Will that do the trick? Actually, we like a large variety of products, not just one or two. There is no one vendor or brand since there are quite a few high quality products to choose from. What we don’t tend to favor are the home improvement center DIY kit type of coatings. However, if we had to choose one of those products, the Rust-Oleum Professional Series is the one to use. Most of your high quality coating products are available from garage floor and concrete coating vendors. You can’t get them from home improvement stores and hardware stores. This product from EpoxyMaster is an example, as well as this system from Roll On Rock. 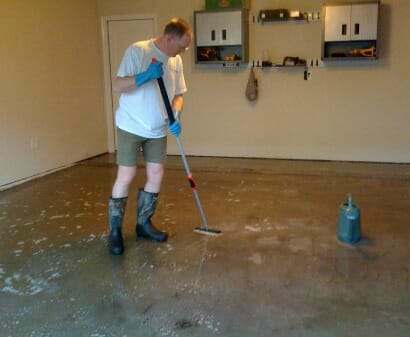 Garage Flooring LLC has some great quality, high solids epoxy systems that you can find here as well. This is just the tip of the iceberg. ArmorPoxy and Legacy Industrial are other examples. Awesome, i will look into those as well. So far I have power washed the garage, made patch repairs, scrubbed the floor with a deck brush after applying a cleaner/degreaser, and now I am renting a floor maintainer today to grind the floor. Assuming that goes well, after making any last patches to floor this week and grinding them flush, then doing a final cleaning (just power washing with water alone, no cleaner), and letting it dry….am I good to finally apply the epoxy next weekend, or am I missing a step? You sound good to go Bpeder. Unless you are grinding wet, skip the power washing afterwards. It only introduces water back into the concrete that you have to let dry out completely. A good shop vac with the floor attachment will pull all the dust up off the floor and out of the pores. Awesome. I did not grind wet, specifically because of the extended cleanup over just shop vaccing the dust. There were some spots along the edges that the floor maintainer did not get all of the white paint off, along with a few spots where theres multicolored paint (from previous homeowners), and a couple oil stains i havent had luck getting completely out – although they are significantly lighter than before I started this process. What should i do about these? Is there something I need to do to paint off completely, or will the epoxy cover them up enough? Thanks for all your help, I really couldnt have done this without you and all the info on your website. Check the oil stains with the water drop test. If water drops will turn the concrete dark and get absorbed, then you are good to go. If they just sit there, then you have more cleaning/grinding to do. If the remaining paint along the edges was roughed up good with the maintainer then there shouldn’t be any problems. As long as everything is flush, it won’t telegraph through the coating. OK, will do. Whats the best way to grind the concrete patches flush? I have tried just about every grit on my sander and it doesn’t get it flush. The masonry wheel i have on my angle grinder cuts into the cement too easily. What do you recommend as the best option to get these things flush to the ground? You need to use a concrete turbo cup wheel. Amazon generally has much better pricing than the home improvement centers. You can find the 7″ wheel here or the 4″ wheel here depending on which grinder you have. This make very quick work of your repairs and will kick up a lot of dust so be sure to wear a respirator. The key is to keep the wheel flat and don’t add too much pressure. Once you get the repairs flush, there is no need to go over them again with a grinder. The process of getting them flush preps them for a coating as well. Use a shop vac to get all the dust up. Unless you are getting gobs of white dust on your fingers after vacuuming, rinsing with water is not necessary. I have a spilt level built in 71 on slab. I want to stain the entire slab, garage and living area downstairs. Problem: while the garage is amazingly crack and divot free, the living area has holes left from old carpet installs over the years. I understand if I repair the holes, they will pick up stain differently. I could resurface the living area but unsure if a concrete skim coat would bond to 50 year old concrete in an active living area? Not interested in epoxy coating. Thanks! Hi Gia. Yes, the holes will pick up stain differently, but some people like that look. It’s important to fill them with a polymer-modified concrete repair patch as well. If you use an epoxy or polyurthane repair patch, it will reject the stain all together. Yes, you can do a skim coat. It just requires proper prep of the concrete. It will bond extremely well and not be an issue. This is a very common procedure that contractors do inside of homes and businesses that want a clean slate for stain, dyes, and etc. I’m working on cleaning my floor to prepare for acid etching. There are some rust stains, paint spills, oil spots, and what looks to be hot tire pickup on the surface. I have scrubbed and scrapped the surface pretty aggressively but I have some stains that just will not go away. I think they are all significantly subsurface, if the floor passes the water test am I good to go or once I acid etch will I open up the surface to these contaminants? I’m going to use a 2 parts epoxy primer from Garage Floor LLC and then a 100% solids from Epoxy-Coat with a clear coat on top with UV protection. Can the surface be ready even though it is not entirely grey/white and has some discolored spots? If it is not ready, will grinding solve my issue or will it not remove all the sub level contamination? Hi Brian. Concrete is never a uniform color, particularly when you are cleaning it then acid etching. Get the concrete as clean as you can first, then acid etch. After that, do the water drop test once it dries on any suspect areas. If they pass the water drop test then you are good to go. How can I etch a concrete floor with in-floor heating? I know I can’t use acids that may corrode the heating pipes. It’s a small room and a grinder is not an option. Is there a grinder that can fit on a drill that would work? I intend to finish the floor with water based dye or 1-part epoxy paint. The room was carpeted so removing the glued down pad residue is a challenge. No stains, oil, etc. on the concrete. Hello Donna. Acid does not do a very good job of removing mastic anyways. You can remove all the glue with ECO friendly bio degradable products. Soy gel such as Blue Bean work well. Like all ECO friendly products, they just take a little elbow grease and time to do their work. After you get the mastic cleaned up, you can etch the concrete with ECO Etch Pro. It is a non-corrosive concrete etching solution that will not harm the tubing in the concrete that provides the radiant heat. Helo, I have ground down by garage floor removing the old paint and leveled off as much as possible the damaged areas caused by road salt. I have a few cracks as well as the divits from the salt damage. The majority of the floor is smooth except for where the vehicles drive onto and park. I would need to use a lot of the Crack repair kits in order to make the floor 100% smooth. Of course I would have to regrind again to give it that etched effect. I will have to purchase one 2 1/2 car and one 1 car kit in order to cover my 3 car garage of 65m3. Not sure why there isn’t a 3 car garage kit. Since I will need to use 2 kits would the extra epoxy not fill in the cracks and divits? Hello James. Since you mention that the product you purchased are kits, we are assuming they are a low solids, thin build coating of some type. Maybe something you purchased at a home improvement center? These type of coatings evaporate solvents or water as they cure which reduces the wet film thickness by almost half. This causes shrinkage which will expose any cracks or irregularities in otherwise smooth concrete. That is why crack repair, pitting, and spalling needs to be repaired. The only type of coating which can be used to fill in irregularities is a 100% solids epoxy done in a slurry coat. This is usually done by commercial floor coating installers. We have an article here about repairing cracks and an article here about repairing pitted areas. An epoxy/sand slurry works real well for the areas that are damaged where your car sits. So if i Have old painted floors that is chipping off, the eco wash will not work correct? I will have to grind it correct? Yes, Edgar. You will need to grind the concrete. The Eco wash will not remove paint.